Dennis Brown released his first album "No Man Is An Island" produced by the late Coxsone Dodd in 1970: he was thirteen years old! Actually this tune was recorded one year early. From the very beginning it was clear that this new sensation would provide more hits in the years to come. In 1972 "Money In My Pocket" was released under Joe Gibbs and it was a huge Jamaican hit. He will re-record it for Gibbs again in 1979. During the 70's Dennis was one of the strongest single voices of Roots Reggae. At the end of the 70's Joe Gibbs and Errol Thompson produced and arranged two seminal sets: "Visions" and "Words Of Wisdom". The album "Joseph's Coat Of Many Colours" is the third top record that was released. But this time Dennis self produced it. In these albums Dennis voice is highly confident mixing pure Roots with a touch of Lovers Rock. All three albums find Brown at his peak as he sings mainly about social issues and at the same time his Rastafari beliefs come to the surface. The set was recorded at Joe Gibbs Recording Studios in Kingston. The backing band is formed of first class musicians. Among these there are: Sly & Robbie (Robbie is on guitar! ), Lloyd Parks on Bass, Tommy McCook on Tenor Saxophone and Sticky on Percussions. The set opens with the powerful message of "Deliverance Will Come" and is followed by the slower and stiff "Oh Mother". Another strong tune is the version of the Earl Sixteen's militant "Malcom X". The Rastafarians beliefs emerge in the political "Repatriation": a flowing tune addressing the African origins issue. "Milk And Honey" is the best track. One of Dennis best. "Stay At Home" is also known as "Ghetto Girl". An almost Rocksteady "Say What You Say" closes the set. This is the first of three great albums from Brown and they are among the great sets of the late 70's Jamaican music. Immediately after "Vision" came the second album of the Gibbs - Thompson duo: the stronger "Words Of Wisdom". If "Visions" was already a very high quality set, this one adds even more confidence. Ruddy Thomas and Oswald Palmer worked along Errol Thompson as engineers. This set established Dennis Brown as a UK star. This success was mainly due to "Money In My Pocket" (the original version is from 1972), which is not that great if compared to other tunes. Among these are: the opening track "So Jah Say", the funkysh "Don't Feel No Way", "Should I", the rocking "Cassandra", "Black Liberation" and "Rasta Children". "Ain't That Loving You" is a tune from Alton Ellis. The backing band as it would be expected is formed by great musicians. Among these there are Sly & Robbie, HorseMouth on Drums, Lloyd Parks on Bass and Dean Fraser on Saxophone. Almost every tune here is a Brown classic. "Wolfs & Leopards" is an official compilation of hit singles released between 1976 and 1977 and it was the first release from the new label DEB started by Dennis Emanuel Brown and the producer Castro Brown in 1977. This re-release from VP Records in 2006 adds three bonus tracks to the original : "By The Foot Of The Mountain", "Brother" (aka "Stop The Fussing & Fighting") and "Breaking Down The Barriers". These songs perfectly fit inside this marvellous collection. The most part of the songs were produced by Dennis, Castro Brown and Winston "Niney" Holness. For the Lee Perry's Black Ark fans it must be remembered that the title track was recorded entirely there. Brown versions two tracks from others: The Heptones' "Party Time" and Slim Smith's "Rain From the Skies" (aka"Rolling Down"). This album clearly stated Dennis faith in Rastafari from the first to the last track. This compilation from the Crown Prince Of Reggae maybe is not a classic but for sure the songs in it deserve this status. Almost a masterpiece! This set from the late Crown Prince Of Reggae contains the whole "Joseph's Coat Of Many Colours" album (1979) plus seven extra tracks that were released through the 1977 / 1979 period by DEB label. The tracks of "Joseph's Coat Of Many Colours" are: "Well Without Water", "Open Your Eyes", "The Creator", "Oh What A Day", "Together Brothers", "A Cup Of Tea", "Slave Driver", "Three Meals A Day", "Man Next Door" and "Home Sweet Home". This album, along with "Visions" (1977) and "Words Of Wisdom" (1979) see Dennis at his peak. As with those sets, the present one is filled with hits from the beginning to the end with some tracks that rightly are now considered as classics. His voice, as with the lyrics, is strong and firm; and it works perfectly over great rhythms. The best songs are: "Open Your Eyes", "The Creator", "Slave Driver" (versioning Bob Marley) and the deep "Home Sweet Home". As stated above this reissue from the English Blood & Fire label comprises seven bonus tracks. Here are some brief comments about these songs. The first is "Emmanuel God Is WIth Us". The Emmanuel of the title is referred to Matthew Ch.1,v.23 which states "...and they shall call his name Emmanuel, which being interpreted is, God with us.". This deep, musically dark and long version (or extended) song clearly shows Dennis Rastafarian devotion. "Promised Land" (aka "Lately Girl") is an upbeat love song. "Troubled World" is a discomix that presents a strong Dub part too. "The Half" versions a track previously deejayed by U-Roy called "The Other Half" and is presented here in its long version. This a typical deep Roots from Dennis. "Want To Be No General" and "General" (a version featuring Ranking Dread) addresses the youth to avoid violence and underlines Dennis approach to gangters in his homeland. Both are great musical Reggae acts. The series of bonus tracks is closed by a different version of "Emmanuel", this time even darker thanks to the overdubs. "Joseph's Coat Of Many Colours" is a beautiful set reissued with some magnificent singles as bonus. It seems that this set is not particularly appreciated by some Reggae fans. Since this set came out in 1985 when Wayne Smith's "Under Mi Sleng Teng" changed forever the Dancehall scene using digital equipment, someone think that this set is out of time. But where is written that you have to change your direction when the wind changes? 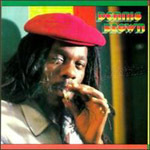 The great and late Dennis Brown here delivers his classic 80s style: some Lovers and some very good Roots too. Three tracks are versions of his own previous material: "Joy in the Morning," "Africa We Want to Go", and "Icy Road,". The rest are new songs. For sure there are far better sets from Dennis but he is such a strong singer that even if the material is not particularly impressive he is able to shine in any case. The most interesting songs are: "Joy In The Morning", "Love By The Score", "Icy Road", "Africa We Want To Go", "Now And Forever" and the strong "Live And Love". This album was produced by Prince Jammy and it was recorded at Channel One. The engineers were Prince Jammy and Soldgie. "The Best Of The Joe Gibbs Years" is a collection released by Shanachie presenting what they consider some of the best material cut by Dennis Brown for Joe Gibbs. Here follows the list of this collection: "Deliverance Will Come" (from the 1978 "Visions" album), "Black Liberation Time" (from the 1979 "Words Of Wisdom" album), "Money In My Pocket [Extended 12" Version]", "Malcolm X" (again from the 1978 "Visions" album), "Oh Mother" (again from the 1978 "Visions" album), "Ain't That Loving You" (again from the 1979 "Words Of Wisdom" album), "Rasta Children" (again from the 1979 "Words Of Wisdom" album), "Coming Home Tonight" (from the 1980 "Spellbound" album), "So Jah Say" (again from the 1979 "Words Of Wisdom" album), "Sitting And Watching" (again from the 1980 "Spellbound" album), "World Is Troubled" (also available in the "The Promise Land " set from Blood And Fire, there as a 12" called "Troubled World"), "Hold On To What You Got [Extended 12" Version]", "Little Bit More [Extended 12" Version]" and "Lovelight" (from the 1982 "Yesterday, Today & Tomorrow" album). This is a quite good collection to introduce the newcomers to one of the unmissable Reggae artists. Four tracks (in red) are pure classics. Five years before his demise in 1999 and twentyfour after his debut for Coxsone Dodd with "No Man Is An Island", Dennis presents "Light My Fire". The set was produced by Alvin Ranglin and co-produced by Errol "Flabba" Holt and Wayne Ranglin. It was arranged by the three of them. Cut and mixed at Leggo's Recording Studio (Kingston), it was engineered by Rohan Richards, W. Ranglin and G. Bravo. The top musicians employed were: Keith Sterling and Tony Asher (keyboards), Squidley Cole and Errol "Flabba" Holt (drums), Earl "Chinna" Smith and Dwight Pinckney (lead guitar), Bingy Bunny (rhythm guitar), Ernest Ranglin (acoustic guitar), Dean Frazer (saxophone) and Harry T. Powell (percussions). Top class credits indeed. Being a lover of classic 70's Roots I spent some a long time to appreciate completely this release. After many listenings I am convinced that this is a very good album. Cut in 1994 it avoids the use of too much digital devices and effects. They are present but only as if to make the thirteen tracks release sounding up to date. At the end Dennis is there strong as always delivering some powerful old style spiced by some contemporary sounds. Best tracks? Almost everything stands on top. The peaks are: "Liberation", the melodic title track "(You Know How To) Light My Fire", "To Be My Lover" a song from his long time friend Gregory Isaacs, the pulsing and powerful "House On The Rocks", the remake of the evergreen classic "General" here in a very fast version, the Lovers' Rock of "When Love Is New" with a wonderful Dean Frazer's sax pointing the background, the fast declaration of love of "I Miss You", the hypnotic "It's Not The Way", the sweet "I Am A Winner" (featuring the beautiful harmonies of Dhaima Matthews who also wrote the song), the strong "Easy Chair", and finally "More Liberation" with some sort of Nyahbingi background which makes the difference. Staying tuned to the digital era Dennis avoided the expected, kept one ear to the past and cut a powerful set. Easy as that! It is 1978 and Dennis Brown in the role of producer goes to Tubby's to put together a Dub session, with Prince Jammy by the mixing board. This meeting brought to two albums, "Umoja Love & Unity" and "20th Century Debwise". The first presented ten Dubs and was released by Dennis' DEB label in mid-1978. The second was released a few months later. The list of the tracks reads "Cool Runnings", "Sounds Almighty", "Umoja", "Guidance", "The Truth", "Cry Of The Destitute", "Mercy For The Needy", "Something Special" (a dark Dub, vibrating and heavy), "Sons Of Dust" and "Structure". Let us see some details. The first track, called "Cool Runnings" is a version of a previous single released by DEB. The song was originally cut by Lennox Brown and it was a version of a Studio One classic called "Frozen Soul". Some of the following Dubs are versions of Dennis' previous material. "The Truth" comes from "The Half", "Mercy For The Needy" from "Troubled World" and "Sons Of Dust" from "Children Of Israel". The album did not sell well and was never repressed. A few months later "20th Century Debwise" was issued. This album presents again ten tracks. The list reads: "Cop’s Spy", "Ting A Ling Style", "Great Man Called Kenyatta", "Thunder", "Dancing In The Street", "Riot In The Streets", "Open The Gate Of Rhodesia", "Robbery In The City", "Murder" and "Ragga Muffin Style". The personnell employed are Norman Grant (only on "Umoja Love & Unity") and Sly Dunbar (drums); Lloyd Parks and Robbie Shakespeare (bass); Winston "Bo Peep" Bowen, Eric "Bingy Bunny" Lamont (only on "Umoja Love & Unity" ) and Earl "Chinna" Smith (only on "20th Century Debwise") (guitar); Errol "Tarzan" Nelson, Ernest Wilson and Winston Wright (piano and all only on "Umoja Love & Unity"); Ansel Collins (organ and only on "Umoja Love & Unity"); Franklyn "Bubbler" Waul, Winston Wright and Ansel Collins (keyboards and only on "20th Century Debwise"); Delroy Hines, Cedric "Im" Brooks and Lennox Brown (horns); Junior Delgado, Uziah "Sticky" Thompson and Flick Wilson (percussion). The bonus track is "General Version", the B-side of the hyper-strong "Want To Be No General" single. The two sets are not the same product. "Umoja Love & Unity" is somehow less interesting but maybe just for the fact that it is less dark than "20th Century Debwise". The former is infact deeper and the general atmosphere is quite raw. Ten gems are spread around in these two sophisticated sets.